I honestly cannot believe that August is over already. This just floated by in the blink of an eye. I didn’t do too much reading this month. I spent a good deal of my focus on children’s picture books and easy readers for my other blog Library Crossing. I was also quite oddly music obsessed this month, cycling through the same three cds over and over again. I find it an interesting overlap of how some of the most ardent music fans are avid readers, and vice versa. Music and literature are not exclusive as one would think. Walk The Moon: I Want! I Want! This summer, I hope you have signed up to participate in the Paris in July celebration hosted by Book Bath and Thyme for Tea. This is a month to celebrate anything and everything French; French food, French movies, French books and, for today, the French language. There are a number of ways to study and treasure the French language. If you are like me, and unable to actually take proper French courses at a community college or University, do not fear. There are a number of free online language learning websites in addition to audio-cds and kits. This is like a free version of Rosetta Stone. With a combination of photos and words, you can learn the very basics of the language. Each lesson has a listening, speaking, writing, and matching segment for 20 slides. You learn the same 20 words with each of the different methods listed above. By the end of the lesson, you will be able to recognize that word based on how its written, pronunciation, and have an image association. If you have a special computer, you can record yourself speaking and other students will evaluate your pronunciation. The same goes for the writing portion, where others will evaluate your grammar and sentence structure. This is a database that is offered for free through most library services. Check with your local library to see if they have subscribed to this service. If they haven’t, go in and demand for it! 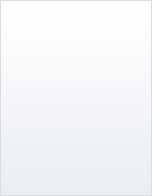 Mango is a way to learn a language on your own time at your own pace. There are a number of lessons provided with visually appealing graphics and slides. There is a narrator at all times to walk you through different conversations, vocabulary and pronunciation. The BBC is not only a valuable news resource, it also has an area devoted solely to the education of European languages. Through their Steps program, you will be walked through a 12-week course of the language of your choice. If you don’t want to sign-up for the weekly schedule, you can access all the worksheets and lesson plans for free online. The site provides videos of different events and conversations, as well as a print transcript of all conversations. If you sign-up for the 12 week program, you will get a nifty completion certificate from the BBC. Also don’t forget to check out the Pimsleur and Berlitz audio-cds that you can listen on your iPod or in your car. These along, with various workbooks, you can find at your local library. Laura Moulton recently received a RACC grant which will fund a project to bring books to the homeless on the streets of Portland, called Street Books. This mobile library is not your typical bookmobile. It is a bike powered cart with about 40 books. She uses a card catalog to keep track of the books and has no expectations of when the books will be due. Only 6 of the 25 currently lent out have been returned. This is awesome in so many ways, I don’t even know where to begin. I’m really excited that this project has been started, especially for a segment of community that doesn’t always get the help and resources necessary. To support the project, there’s a PayPal account accessible through the Street Books website, where you can sponsor individual books that’ve been requested. This book was read as part of the Miss Marple feature, hosted at The Sunday Book Review. This week’s discussion is centered around the Miss Marple novel: 4:50 From Paddington, or What Mrs. McGillicuddy Saw! On a typical train ride to visit a dear friend, Elspeth McGillicuddy witnesses a most severe and heinous murder through the window into a train headed in the opposite direction. With no one believing what she saw, Mrs. McGillicuddy turns to her friend Miss Jane Marple for advice. Soon Miss Marple is on the case, leading us through a series of events and clues as she tries to solve the murder of the mysterious woman. Following the classic mystery formula, I think fans of Dashiell Hammett will really appreciate this book because of its wit, humor, characters and the twisting plotline. I tried to guess who-dun-it numerous times and was wrong at each turn. I adored all the characters, especially Miss Marple. She reminded me of Angela Lansbury from the Murder She Wrote TV series I used to watch as a child. 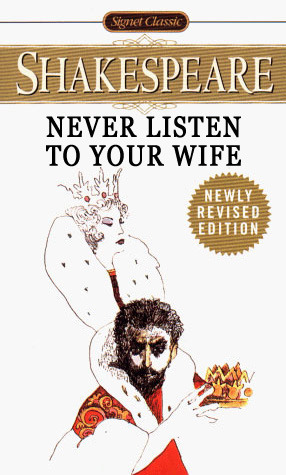 This was my first Agatha Christie book and I deeply regret I never read her work earlier. There were quite a few mentions of other mysteries that she solved sprinkled throughout this novel. I would have loved to known about those crimes and how she solved them. Digging into the death of the mysterious woman, Miss Marple and her aides are led into the Crackenthorpe estate. This is a home of greedy children, a miserly old father, tension and frustration oozing throughout the family members. Anyone and everyone in associated with Rutherford Hall is a suspect, but just who is the suspect? That is cleverly disguised through various clues, alibis, subsequent murders taking place. 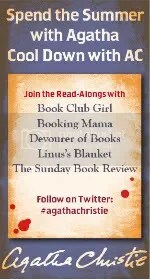 Join the discussion of 4:50 from Paddington at The Sunday Book Review and be a part of the Cooling Down with AC group this summer. In addition to the Agatha Christie Summer Celebration that I want to take part in, I am also signed up for the 2nd Annual Paris in July, hosted by Thyme for Tea and Book Bath. Given my penchant for reading books set in France or Paris, this should be a piece of cake, or rather a piece of eclair, a roll of croissant, etc. I spent 6 days of my honeymoon in Paris this April. I spent a grand total of 9 days in France when you include the weekend stay in Arles in Provance. 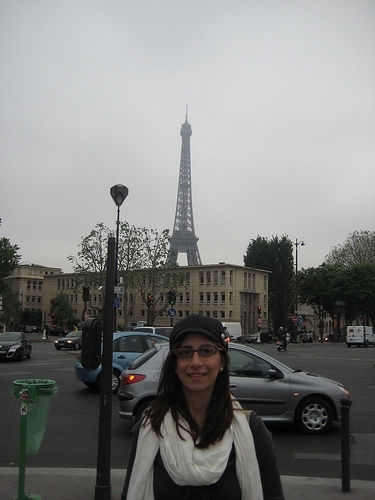 I am desperate to get back, and Paris in July is a wonderful way for me to relive my days in Europe. I hope you will sign up with me for this fun event!! 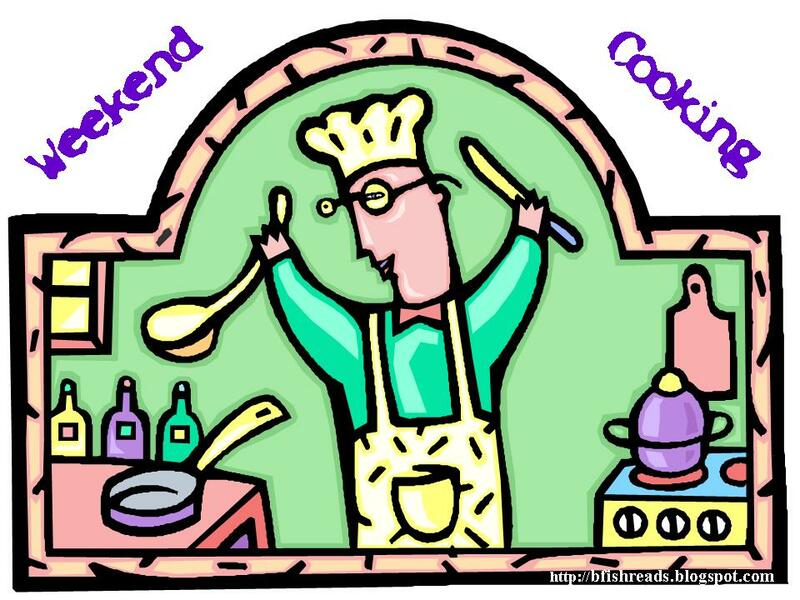 Weekend Cooking is open to anyone who has any kind of food-related post to share: For more information, see the welcome post. This is quickly becoming one of my favorite and most frequently used book on my cookbook bookshelf. Although by no means comprehensive, this A to Z guide does offer appropriate substitutions for the most basic and frequently used food items in recipes. This is a $10 resource that I bought at Borders when they were going out of business at the mall. I always beeline straight for the cookbooks when bookstore go out of business because those are some of the most expensive, reusable books in the industry. This inexpensive find is definitely a great resource. I can’t tell you how often I have to leave food on the hot stove to look up substitutions on the Internet. Usually in that time, something either burns, or overcooks. This way, if I stumble upon an ingredient and come short, or am missing altogether, I can quickly assemble a respectable substitute without much haste. This is also a great way to use up the less frequently used items in my pantry. Here are a few examples of the substitutions listed in this book. = 7/8 cup cottage cheese blended to break up curds, mixed with yogurt if desired, and 2 tbsp milk and 1 tbsp lemon juice, blend well. This book is also reviewed as part of the Foodie’s Reading Challenge. This is my first Weekend Cooking post, a fantastic meme run by Beth at Beth Fish Reads. 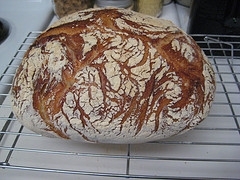 For today’s post, I want to cover breadmaking. I am a novice to baking breads, although I excel at zucchini breads. Anything that involves using yeast, kneading and other methods is usually hit or miss for me. My first attempt at bread making, I followed the New York Times No Knead Bread Recipe that I had read about in Cathy Erway’s Book: The Art of Eating In. It was delicious, light and fluffy and above all, it was well made bread. So, being on a bread kick, I attempted to make more bread. Well, the next three batches ended up as bricks because the yeast wouldn’t rise. I have up on the No Knead Bread Recipe and found this wonderful book that has really been beneficial to my breadmaking experiments. The Bread Book by Sara Lewis, is an easy guide for breadmaking. It covers everything from loaves to bagels to non-yeast breads. What I really appreciate about this book is that each recipe is written for baking bread by hand, and for baking bread via a bread machine. I do not have a bread machine, but if I ever get one, I am already set. The instructions are easy to follow, and the first section of the book covers has photographic instructions of how-to certain instructions; such as kneading the bread, folding it, and the different types of flour used in the book. Most recipes take about 4-5 hours (that involves all the hours that the bread has to sit on a shelf and rise). I’d say total prep time is usually about 30 minutes (mixing the ingredients, kneading the bread) the rest of the time is letting the bread rise, then putting it into the oven for another 30 minutes. Most of the recipes involve multiple ingredients that may be difficult to find at normal grocery stores, and by this I mean all the various types of flours and powders used. From this book, I have made: A Quick White Loaf, Feta and Spinach Twists (big hit!) and plain baguettes. Do any of faithful yet silent readers bake? What are some of your favorite bread making recipes, or books? Better Book Titles…I recently stumbled upon this website and its quickly growing into one of my favorite sites. Bay Area folk should bookmark next weekend, May 21st & 22nd for the annual San Mateo Maker Faire. Learn how to make crafts, buy crafts, and have a really good time overall. The site intends to provide information for all things literary: suggestions on what books to buy, reviews of books, excerpts from books and news about authors. Visitors will also be able to buy books directly from the site or from other retailers and write recommendations and reviews for other readers. A fantastic and creative ad for reading. A surreal coat hanger craft project. 3 men who live at an IKEA store.